An ideal grass for the quick establishment of a temporary lawn. 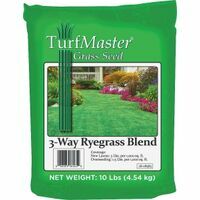 Perfect for over-seeding grasses like Bermuda, Zoysia and other warm season grasses. Best for a temporary, seasonal lawn. Fast seed germination and turf establishment. For use in full sun to lightly shaded areas. Penkoted for seedling protection.